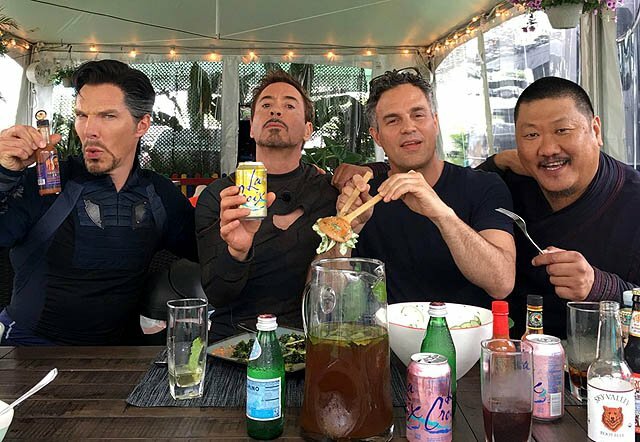 Tony Stark, Bruce Banner, Doctor Strange and Wong continue to fight evil on the set of Avengers: Infinity War, and new location photos have popped up on Just Jared featuring a look at some new Iron Man armor. Check out the photos by clicking here! 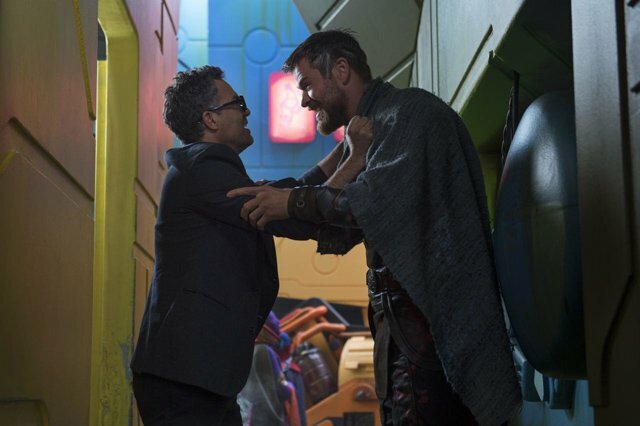 Another interesting detail we noticed is Mark Ruffalo’s Banner appears to be wearing the same suit/pants ensemble he wears in Thor: Ragnarok, which might indicate that the events being filmed right now take place shortly after those in the Thor threequel. Check out the Ragnarok photo below, then check out the new set photos. Do you think it’s the same outfit? Confirmed cast members for the film so far include Robert Downey Jr., Chris Evans, Mark Ruffalo, Scalett Johansson, Chris Hemsworth, Anthony Mackie, Paul Bettany, Elizabeth Olson, Chadwick Boseman, Sebastian Stan, Don Cheadle, Chris Pratt, Dave Bautista, Zoe Saldana, Pom Klementieff, Benedict Cumberbatch, Benedict Wong, Sean Gunn, Tom Holland and Josh Brolin. Filming officially started on Monday, January 23, 2017 for the Avengers sequel, which sees Earth’s Mightiest Heroes teaming up with the Guardians of the Galaxy to take on Brolin’s Thanos. Directors Anthony and Joe Russo, who return after Captain America: The Winter Soldier and Captain America: Civil War, are directing both Avengers: Infinity War and the untitled fourth film, which will be filmed back-to-back in Atlanta and are written by screenwriters Christopher Markus and Stephen McFeely. Both films will also be shot entirely with IMAX cameras.